Chairman & CEO: Bates Management Consulting Inc.
Ajit H. Someshwar is an Indo-Canadian entrepreneur, philanthropist and social activist based in Toronto, Canada. He is President & CEO of CSI Group. 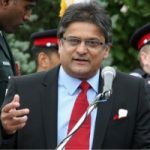 He is the co-founder and current Chair of Canada India Foundation—a public policy organization. Someshwar was appointee of the Government of Canada to the Board of the Export Development Canada. Prior to this, during the 2008-2009 global recession crises, Canadian finance minister Late Jim Flaherty appointed Someshwar to an 11-member advisory panel along with likes of Mike Lazaridis, Paul Demarais and Geoff Beattie to advise him on the federal budget and the economy. It was announced that Someshwar, along with the other 10 members were only paid a dollar a year for their insights. Someshwar was born in Bombay (Mumbai). He obtained a degree in Commerce and Economics from the University of Bombay. He also has a Chartered Accountancy (C.A.) designation from India and England & Wales. Prior to starting his businesses in the early 1990s, he was vice-president of operations, planning and analysis for CIBC’s assurance venture. He moved to Canada from England in 1987. Someshwar is an active fundraiser for hospitals, charities and the arts. In September 2010, Someshwar along with fellow businessmen donated a Maple-Leaf Shaped 17 ton Monument to the Canadian Armed Forces for their exemplary service as global peacekeeper. The unveiling ceremony was attended by a large number of Canadian Armed Forces personnel in their ceremonial attire, as well as leaders including defence minister Peter Mackay, opposition leader Michael Ignatieff, and finance minister Jim Flaherty. Someshwar is on the board of Providence Hospital and is currently the chair of MAPP (Men Advancing Philanthropy for Providence). He was the President of the Indo-Canada Chamber of Commerce from 1991 -93. Someshwar is an active public speaker and participant in various policy forums. He has advised governments on both sides on the Canada India Civil Nuclear treaty. He has been very vocal about the importance for the provincial and federal governments to put in a concerted effort on regularizing immigrants professional qualifications and experience, making the process of absorbing them into the Canadian system a little less painful.